Personality: Baldamar is a smith with few rivals, and knows it well. He sees no shame in bragging about it, and he attributes most of his crafting skill to his past combat experience. Though he wasn't able to get the job he hoped for, he appears mostly content with being able to interact with the students, advising them on which equipment would suit them and occasionally offering commissioned items. In conversation, he proves to be a dense individual, and a tad bit arrogant in that he rarely notices his errors. 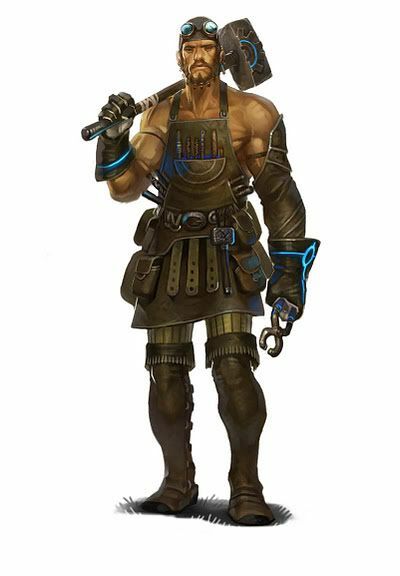 History: Though he first made his name as a soldier and then as a duelist, Baldamar has long practiced a variety of forms of smithing, ranging from jewelry to the difficult-to-handle Ultra Greatsword. He has made a decently stable living from it, even though he often goes off commissionary work alone. Though he takes pride in his creations, his true dream was always to supply warriors with knowledge, not arms. Smithing was merely his second-best option. When the Darksons opened their academy, Baldamar saw his chance, and attempted to apply for a position as a teacher there. His eccentricities weren't taken well, however, and he was deemed unfit for a 'real' teaching position. He still had undeniable skill as a craftsman, however, and took a job maintaining the school's equipment instead. Since then, he has mostly spent his work hours tallying, fixing, upgrading and adding to the school's stock. Other Notes: Baldamar will have a high Synthesis skill, with Strength close behind and next-to-no Magic if any. He will be a resource for others to obtain weapons and armor they cannot craft for themselves, as well as upgrading existing equipment. Also, this character will completely replace Annabeth Lee-Clement, and so my account will be changed after acceptance.